The past several weeks, this weekly post has featured average, everyday people doing good things for others, and really, that is perhaps the best sort of philanthropy there is. It motivates us all, reminds us that we don’t need to be wealthy or powerful to do good things, to help make the world just a little bit better. Giving, after all, begins in our own backyard. Today, however, I want to focus on a man who is, by most standards, wealthy, but his philanthropy far exceeds his own personal wealth. His name is Charles Francis Feeney, but his friends call him Chuck. I suppose most of us worry about our health from time to time, be it physical, mental, artistic or spiritual and at times feel as my dad used to say ‘feel at the bottom of the wheel’. The question can arise if or when something should be done about whatever it is not just for your own well-being but for those close to you in the fall-out area. How much does your state affect them? You see my demons have got a hold at the present and this will not do. They come sneaking up on the blind side every time. The side that loathes Intolerance, Ignorance and the Plain Stupid. Using those they can pump that up pretty good and they’ve had plenty to work with. The prejudice and self-delusory short-sightedness of a large number of the Brexit voters. The sheer bile and venom arising from the last US presidential Election, and the subsequent amateurish way this administration has started off. The Islamophobic response to the London terror attack. And the recent insight into the Sandy Hook conspiracy creatures. Yes, you might say, you have good cause to be angry at them all. Yes, but not the thundering venomous abusive response I have problems keeping in check, not the sort of remarks I have bouncing around in my head, which are not being released. For once they are released then more follow and then suddenly you are in a whole new way of life. You are looking to be offended, you don’t really spend much time thinking about the victims, you just want to hurt and humiliated the preps, the more damage you cause, the better; the urge to break one. My wife has to put up with this imitation of an Old Testament character striding about the place. So I’m putting myself in quarantine for a while, work on the Patchwork novel and maybe start on another volume of the History. No reading of news either. This is a sort of retreat. Clean out the toxicity, and take some time to work out how I can up-grade my blog too; it’s been two years I should be able to have learnt something by now. I wish you all the very best and secure in the knowledge that you will all keep on with your good works; interesting, entertaining, captivating and challenging. Give me a couple of months, there’s no way I could ever truly leave WP. My good WP friend Simon (sfarnell.wordpress.com) was kind enough to nominate me for this for which I am very grateful and thankful as I think it is one which is manageable. “1. Thank the person who nominated you. 2. Answer the 11 questions. 1. When you see blue skies and a sunny day what do you want to do most? 2. What’s the most ‘blue skies’ thought you’ve ever had? 3. What’s your favourite season and why? Winter!….. for all the wrong reasons associated with normal people. 4. Has there been a moment in your life that stands out above anything? What was it? The WP buzz from associating with so many creative, friendly and helpful folk. 6. What do you think could make blogging better? 7. What’s your favourite TV series? 9. What was the last piece of music you bought? 11. What was the last thing you did that you thought you wouldn’t like but were surprised you did? Did as I was told and went to my wife’s hairdressing salon to get my unruly hair sorted out. 1. Would the list of people you would like to slap in the face with a custard pie exceed 1 A4 sheet? 2. What is the most inspirational natural event you’ve ever seen? 3. Film critics. A necessary evil or an unnecessary encumbrance? 4. Have you ever had the urge, dream or wish to fly by your own power against the stars? 5. Self-publishing. Full steam ahead or cautious? 6. The Minions. Do you feel. They should be running the country. They are running the country? 7. What is your blogging ambition? 8. Have you given up on Social Media in general? 9. Your favourite walks. Coast. Countryside. Woodlands. Uplands? 10. Do you write in silence, to music, or another source of inspiration? 11. How do you feel about the fact that this blogger has classified you are a hero for enriching the WP and hopefully the world in general with your contributions? Presidents of the USA have a great deal written about them. If they did nothing, that would be naturally cause for volumes. If they managed to please everyone that would also be cause of much discussion and opinion. And the current president, well he’s a bit of an easy one isn’t he? All you need to do is to go on social media write ‘Trump’ followed by an emjoi, just sit back add the occasional different emjoi and your profile goes through the roof. Now The US constitution does have written into its many words parts which limit the powers of a president and even the most experienced politician has to learn that all over again, so President Trump with an amateur’s background might have a lot of catching up to do. But this is not a call-out for the more subtle and nuanced arts of politics; this is more basic, this matter is directly within the scope of not The President but Donald Trump the person. This story relates to the tragedy at Sandy Hook and the unbelievable activities of the Conspiracy Creatures (folk I never gave ANY time to, now they have reached a Defcon 1 in my book). I am not going to relate the activities in my own words because these will lapse into profanities, aspects which taken out of selective context could not read well, and a very long discourse on why an authoritarian state is a good idea; all of which would show a complete lack of balanced judgement and would eventually serve only to nullify my argument. It was one of the worst school shootings in American history, but some people insist that the Sandy Hook massacre never happened. They post YouTube videos and spread rumours online, and their false theories have been repeated by a media mogul conspiracy theorist who has been linked to Donald Trump. Now, after years of harassment, the families of the victims are fighting back online. Lenny Pozner clicks on a YouTube video showing his street and the outside of his home. The camera zooms in on his balcony, and his address and a route to his door flash up on the screen. Because of videos like this one – there are dozens on YouTube, and more appear ever day – Pozner doesn’t want to disclose the city where he now lives. He’s had death threats and has moved several times in recent years. Lenny Pozner has been targeted because he’s fought back against trolls and conspiracy theorists who make sweeping and false allegations about the murder of his son. “Noah was just a regular six-year-old child,” says Lenny. “I dropped him off that morning – it really was an ordinary day of getting the kids ready for school. The nightmare began on 14 December 2012 when a young man named Adam Lanza killed his mother and then drove to Sandy Hook Elementary School. In a matter of minutes, he shot dead 20 children and six adults, before taking his own life. 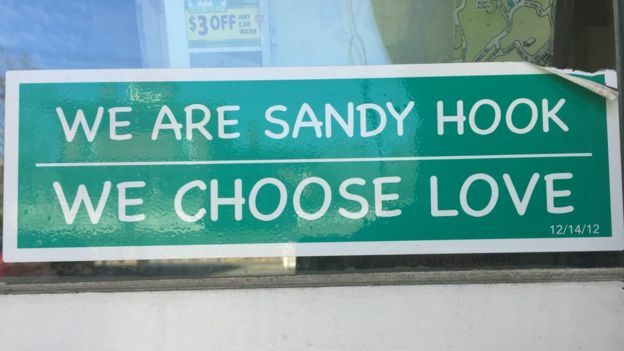 Even in a country where mass shootings are common, Sandy Hook stood out. The pupils were so young, and there were so many of them. Hundreds were traumatised – and many still are – after witnessing the carnage and its aftermath. And yet despite extensive investigations and a report which determined that Lanza acted alone, conspiracy theorists have constructed a fake alternate reality in which the whole thing was an elaborate hoax, staged by the government to try to introduce strict gun control laws. They seize on small inconsistencies between initial news reports from the chaotic scene and the facts. The more extreme among them have targeted the families of Sandy Hook victims. There have been at least two arrests linked to the hoax theories. On Wednesday, a warrant was issued for a Florida woman who is accused of harassing Lenny Pozner. On a sunny, late winter’s day in New England, Hannah sits in the stately Newtown Public Library, down the road from where her sister was murdered. She recalls her sister’s spirit, her profound positive influence on her life, and her work with autistic children. Her voice is subdued, but quivers with quiet determination. Some of the conspiracy theorists are regular visitors to this small hamlet in suburban Connecticut. In addition to the death threats and harassment directed at Lenny, Hannah and others, they’ve made videos of the school and local area and ask questions of locals and family members, and have posted the footage on YouTube. And their theories have been picked up one of America’s most popular conspiracy theorists, a man who has been linked with President Donald Trump. The online storm has prompted Lenny to form a volunteer network to track and take down the conspiracy theory videos and websites. And other Sandy Hook residents are pleading with President Trump, asking him to speak out and help stop the madness. Wolfgang Halbig lives in a big yellow house in a sunny, lavishly landscaped gated community in Florida. He’s a retired school administrator and safety advisor, and he says that when he first heard news of the Sandy Hook shootings, he was sitting in a chair in his living room, drinking coffee. Halbig donated money to the Sandy Hook families. But he soon became both obsessed with the tragedy – and, somehow, convinced that it never happened. Halbig has since devoted years of his life to “exposing” what he thinks is a government plot. He started a website. He’s revealed personal information about the victims of his attacks, including names, addresses, legal documents and financial information. And he’s personally travelled to Sandy Hook a number of times. In his office, ghoulish blown-up pictures of the crime scene mingle with pictures of his family and his days as an American football player. His so-called evidence consists of a string of tiny details, small anomalies which are for the most part easily explained by the inchoate nature of a horrific breaking news event. Conspiracy theories are a perennial feature of American life. But now they can be picked up by extremists and spread virally through social media. And that process has been fuelled by America’s deeply partisan political environment. 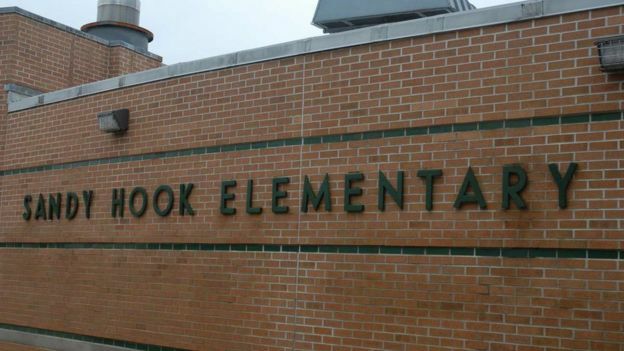 Hundreds of videos online are pushing false Sandy Hook narratives. Collectively, they have millions of views. Falsehoods are repeated by Twitter accounts and on Facebook. Still, the theories might have stayed quarantined in some of the darker corners of the internet, were they not picked up and amplified by one of America’s most popular conspiracy theorists. Alex Jones is a talk show host and the founder of the multimedia portal Infowars. Regular listeners and readers are used to his rants on everything from 9/11 to attacks across Europe. And on several broadcasts he embraced the Sandy Hook conspiracy theorists. Less than two years after the attacks, he welcomed Halbig on his programme and talked about an Infowars story headlined “FBI says no one killed at Sandy Hook“. “Internet sleuths immediately took to the web to stitch together clues indicating the shooting could be a carefully-scripted false flag event, similar to the 9/11 terror attacks, the central tenet being that the event would be used to galvanize future support for gun control legislation,” the story stated. The liberal think tank Media Matters for America has listed other instances of Jones accusing the parents of murdered children being actors or casting doubt on the Sandy Hook investigation. Matt Gertz of Media Matters says that online and on air, Jones has an audience of about 8 million. 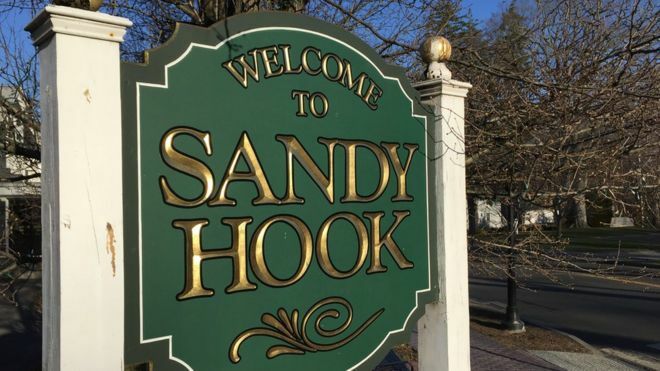 “It’s kind of remarkable, but believing that Sandy Hook was a hoax is actually fairly small ball for an Alex Jones conspiracy,” Gertz says. “He thinks that a set of global elites are planning to murder 80% of the world populace and enslave the rest of them. He has claimed that the federal government has a weather machine that they use to target tornado strikes on unfriendly populaces. Jones, who did not respond to repeated requests for an interview, has also been linked to President Trump. In late 2015, Trump appeared on Jones’s radio programme. At the end of a half-hour interview, the candidate told the host: “I just want to finish by saying your reputation’s amazing. I will not let you down, you will be very very impressed I hope. 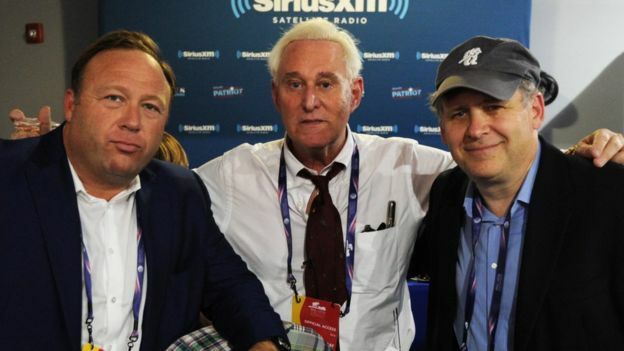 Former Trump campaign advisor Roger Stone regularly appears on Jones’s show, and reportedly was the person who introduced the presidential candidate and the talk show host. Trump has retweeted Infowars reporters and stories (for example here and here) and stories of dubious provenance that first appeared on the site have regularly shown up in Trump speeches and tweets. The message repeated an allegation with scant basis in fact – a story that had appeared on Infowars earlier that month. Trump has not endorsed the Sandy Hook conspiracy theory, nor has he spoken about Jones’s claims that the massacre was a hoax. The White House did not respond to a number of requests for comment, including a series of questions about the relationship between the president and Jones. Jones himself has tried to make the most of his connections to Trump. 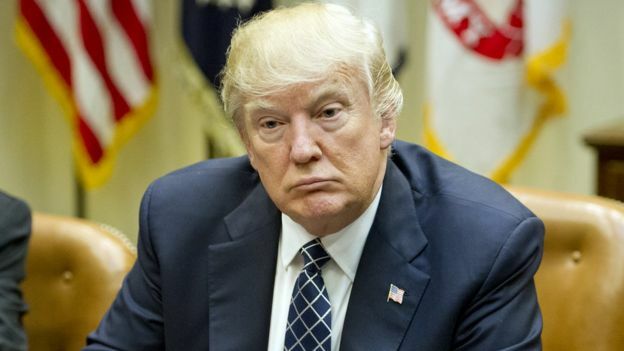 He claims the president called him shortly after winning the election and has spoken to him since, although the the New York Times reported that a Trump aide, speaking on condition of anonymity, “played down the frequency of their contact”. Gertz, from Media Matters for America, says that there is evidence that Jones does talk with the president. But he cautions that both men have had a history of pushing conspiracy theories and presenting “alternative facts”. “So trying to nail down for sure what their relationship is, based on the statements that they say about each other, is pretty dicey,” he says. Less than two weeks after the 2016 presidential election, Jones posted a video which he declared was his “final statement” on Sandy Hook. In it, he claimed he had been unfairly treated by the media. 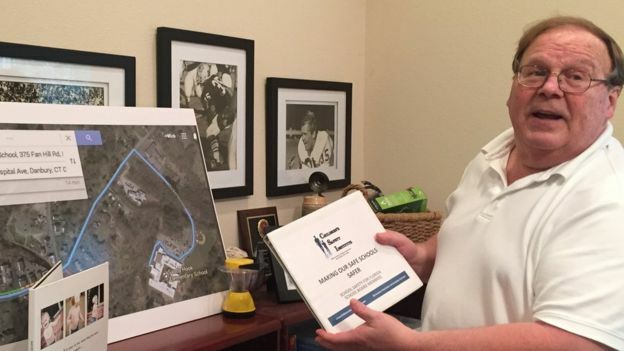 “I’ve always said I’m not sure what really happened, but there’s a lot of anomalies and there has been a cover-up of what did happen there,” he said. He then played a montage of news clips and material from his Sandy Hook programmes over the years, including footage of Wolfgang Halbig. He did not include his “Sandy Hook is a synthetic, completely fake with actors” quote. In signing off, he took another swipe at parents of murdered children who spoke to the media in the aftermath of the attacks. In front of his computer screen in his undisclosed location, Lenny Pozner is taking on the conspiracy theorists. He flicks through a YouTube page and points out a new video. The thumbnail picture has a photo of his son Noah’s tombstone. There’s text on the picture which reads: “empty grave”. In the video, there’s a picture of Lenny himself. Lenny used to be a casual Infowars listener – he liked to listen to conspiracy theories as entertainment. That’s how he initially found out that his son’s murder was being denied by the conspiracy theorists. At first he tried to engage with them through a Facebook group. But soon the mood among the hard-core hoaxers hardened. “The only people that would come into the groups were trolls,” he says. “They were just coming in for their own amusement… after that I decided that the most important thing would be to start taking down content that’s spreading this information,” he says. Every day, Lenny scrolls though reams of conspiracy minded content, complaining to social networks and attempting to get videos and posts taken down using network rules about copyright, decency and harassment. After four years of pain, compounded by the harassers and the conspiracy mongers, people in Sandy Hook are tired – and some of them are asking the president to step in. I meet Eric Paradis, a local Democratic Party official, in a bar down the road from Sandy Hook. 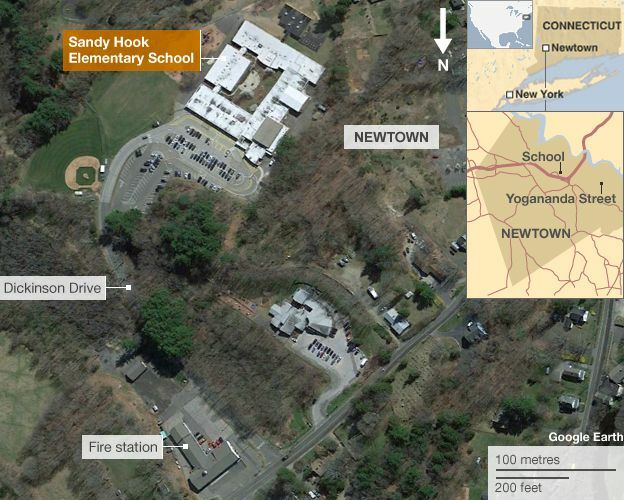 One of Paradis’s daughters was at Sandy Hook Elementary on the day of the shooting – she survived. Although Alex Jones has not been involved in the harassment of the families, Paradis says the president could use his influence to push Jones and the conspiracy theorists to the fringes, and help stop the harassment of Sandy Hook victims. “The town committee wanted to put a letter together asking the president to denounce these hoaxers and tell them look… these are real children who died,” he says. The letter goes on to ask Trump to “intervene and stop Jones and others hoaxers like him”. Paradis says he and other Democrats tried to avoid making the letter about Trump’s larger political agenda. Lenny Pozner continues to take action against the trolls. He’s filed a lawsuit against Halbig, alleging invasion of privacy. Halbig is fighting the suit, which is just getting underway, and says that if he loses, he’ll check himself into a mental institution. Lenny turns back to his computer, where he spots more conspiracy theory videos. So will he ever stop trying to fight the hoaxers? He takes a deep breath and a long pause. I would ask you to consider the parents. If President Trump does not about this then by that lack of action alone he is not worthy of the title. I would ask citizens of the USA keep a very close watch on the activities of President Trump and let us know if he is mature and compassionate enough to distance himself from these creatures. And I would ask all WP folk to keep writing your own uplifting posts, share with the world and put an end to these creatures.